KCMA Corporation has unveiled the Tier IV Final version of its popular 70Z7. KCMA Corporation, a subsidiary of Hitachi Construction Machinery Group and marketers of KCM loaders in North America, unveiled the Tier IV Final version of its popular 70Z7. The new 70Z7 cycles faster, is more powerful, has near zero emissions and is designed to be even more fuel efficient than previous models, according to KCMA. The 70Z7 is equipped with a 3.7-cu.-yd. GP bucket and produces 173 gross HP from a Cummins QSB6.7 diesel engine. Key to these performance breakthroughs is the industry-exclusive KCM IntelliTech Operating System that provides sophisticated control of all systems. Other features in the IntelliTech package include a variable-speed reversible fan that minimizes parasitic power drain while providing maximum cooling as needed. 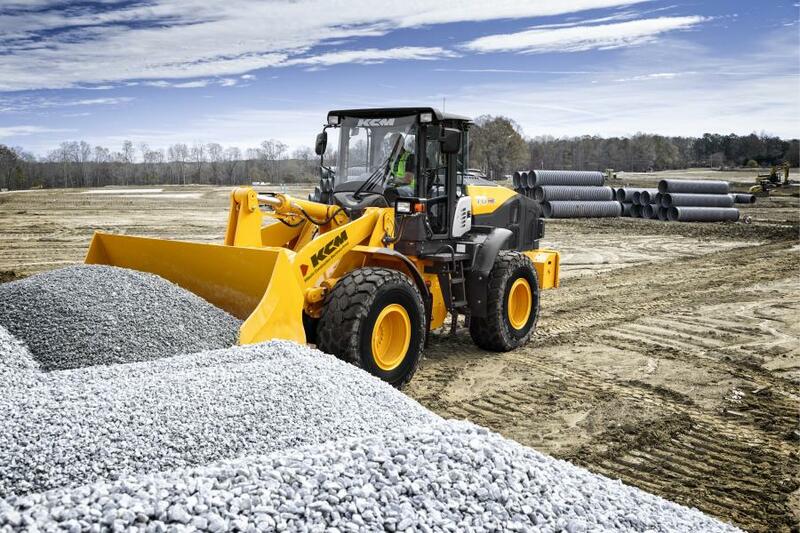 The 70Z7 T4F wheel loader is a very versatile utility loader. A workhorse in snow removal, agriculture, pipe and utility work, recycling and wood mill operations, it is stable and responsive, with tight turning circles. Available buckets range from the 3.7-cu.-yd. standard GP bucket to the specialty 5.75-cu.-yd. refuse bucket. The KCM 70Z7 T4F has one of the simplest emission systems in the industry. It achieves Tier IV Final standards without a Diesel Particulate Filter, which means no DPF plugging, no DPF regen, and none of the costs associated with DPF servicing. Use of a Diesel Oxidation Catalyst (DOC) and Selective Catalytic Reduction (SCR) technology that injects Diesel Exhaust Fluid (DEF) meets all Tier IV Final emission requirements for construction machinery. Maintenance enhancements include the extended 500-hour interval oil changes, along with the extended 4,000-hour hydraulic oil change interval, effectively reduces these maintenance costs by over 50 percent. The 70Z7 T4F is very fuel efficient, too. When in operation, the 5 Speed Automatic Transmission with variable shift points provides faster speeds and fuel saving. Conversely, the Auto Idle Shut Down feature senses excessive idling and shuts down the engine increasing fuel efficiency. The roomy cab is ROPS/FOPS certified and offers outstanding visibility in all directions, according to KCMA. The 70Z7 T4F also has been updated to include the full-color LCD multi-function instrument panel providing clear, concise information derived from the KCM IntelliTech Operating System, including machine operations and settings. This panel also houses a standard super-wide angle rear view camera easily viewed by the operator. Hydraulic controls are fingertip, pilot assisted levers. The steering wheel has a tilting/telescoping steering column that adjusts to fit operator preference and provides for easy access to the air suspension seat. The standard telematics system, KCM Global e‐Service, monitors and collects operating data and alerts, which it transmits to equipment managers, owners and dealer personnel allowing for a proactive and efficient management of fleets, maintenance schedules and operating efficiencies. For information on the 70Z7 T4F wheel loader, or the entire KCM Wheel loader line, visit www.kcmcorp.com/products/wheel-loaders/70Z7-T4F.